“Cheers!” “Prost,” and exclamations of “I love beer!” emanated from Elings Park along with the heat (and not just from me) during last Saturday’s festival of beer, sausage, music, and costumes. 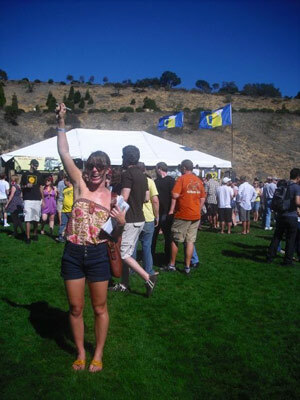 It’s no surprise that most everyone at the 2009 Santa Barbara Beer Festival-beer lovers, drinkers, tasters, and super-stoked college students-spoke the same language, slight slurring included. 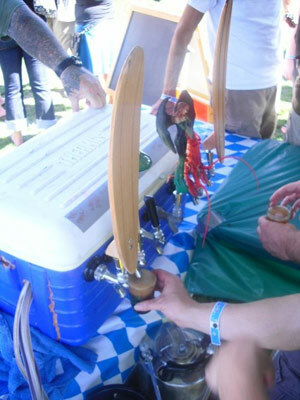 One group of pretzel-necklace-beer-drinkers informed me that the Santa Barbara Beer Festival is up there, in their opinion, with some of the best beer festivals anywhere, since it’s big but not so hyped up that the entrance fee is overinflated. Forty bucks for an afternoon of unlimited beer and free music is a steal, no? And an added bonus: Proceeds go to support two nonprofits, Elings Park and the Santa Baraba Rugby Association. On my way to seek out home brewers, I passed by an exceptionally smoky vendor. For a percentage of tobacco smokers (I’ll venture to say a “largish” one), the smoking experience is enhanced by alcoholic beverages (and vice versa), so the cigar vendor at Beer Fest didn’t seem out of place. It was the man wearing a furry, full body gorilla suit, entering to win a raffle for three torch lighters at the cigar stand who really caught my attention. The winner of the costume contest wins a ticket to next years beerfest; I saw a couple guys in lederhosen, a pirate, and others, but none as dedicated as the man behind the gorilla mask. He must have been sweltering standing in Saturday’s heat, cigar in hand. Good thing he had a variety of cool, tasty beers. It may have been the Hefeweizen, but the urge to run up and hug the gorilla grew stronger by the second, so I got myself away from him and mosied over to the Santa Barbeerians, our own local home brewing club. I had the pleasure of drinking with club’s President of Vices Doug Jones. He explained that the Santa Barbeerians have a monthly meeting and competition, where each member’s brew is judged, and that the Santa Barbeerians also present an award for “Best Home Brewer of the Year.” Additonally, the Santa Barbeerians attend Beer Camp every summer to hone their skills-14 Beer Camps so far. Beer Camp: four days of drinking and camping, an average of 150 people in attendance, and 40 beers on tap. Oct 14, 1978 is an important date for home brewers-the day Jimmy Carter passed a bill declaring that people are allowed to homebrew, partly because his own brother, Billy Carter was a homebrewer. History! But it’s purely a hobby (or lifestyle), homebrewing; it is illegal for homebrewers to sell their brews, which may explain why homebrewers love beer festivals-so many people can enjoy their home creations, like Doug Jones’ mead. “Mead is made of honey, orange juice, and dates,” Jones commented as he filled my glass. I thought immediately of Beowulf as the sweet brew hit my lips, and enjoyed it like a true Dane. The Santa Barbeerians inspired the other Homebrewing Club at SB Beer Fest, C.A.R.P., which boasted the longest line for some time. They must be good, I thought. Moments later, upon shaking the hand of Dan Reyes, president of C.A.R.P and former Santa Barbeerian, I found my tasting glass full of Dan’s Belgian Dark Chocolate Strong-and my instincts were right. Dan explained that there isn’t really any chocolate in the beer, though. The taste comes purely from grain manipulation. Dan made this style of beer with “Hans,” a beer-making sculpture he brought along. A three-keg, vertical structure with a small gargoyle fixed on the top to “ward away bad spirits, like bacteria,” next to an American flag, Hans helps Dan make most, if not all, his beer. C.A.R.P. member Gary Dempster refilled my tasting glass with his flavorsome Red Saison before I tried some of C.A.R.P.’s other beers: Hoppy Harvest Ale, Weizenbach, and Le Harvest. Of course, homebrewing is a hobby, but why stop there? Pete Johnson, head brewer of The Brewhouse, started off as a homebrewer, brewing beer for fun. “But then it got to where at work, all I thought about was beer,” Johnson explained, “so I needed a job where thinking about beer all the time is useful.” Smart guy. Makes a darn good Barley Wine, too. Around 3:30 p.m., I sipped Leinenkugel’s Sunset Wheat beer (which tastes like Fruit Loops) as the music from one of the three live bands picked up. Beer festers began to gather and dance to energetic tunes (“Play that funky music, white boy:”) before the costume contest and raffle prizes began. Santa Barbara Beer Festival 2009 costume contest categories include group and individual. In an effort to discern which group effort should win, the announcer challenged two costumed groups to see who could make the highest person-pyramid, a difficult task after a full day of beer. I cringed a bit as the first group collapsed, but celebrations quickly ensued for the winning group, Mickfest, comprised of UCSB graduate students there to support Micky Nelson’s 26th birthday. In the individual bracket, the gorilla won, hands down. I hope I see him next year, I thought as I passed through the exit gates of the festival with a buddy, full of sausage, beer, and resolution to return. SB Beer Fest 2009 was a great success, even though I never did go get that hug, after all.